From paying healthcare surcharges on bills to advocating for higher minimum wages, diners may tip the scales in favor of sustainable restaurant labor. Our puzzlement reflects the challenge faced by activists and restaurateurs trying to carve out just conditions for food workers. The movement to include justice in our sense of what constitutes “sustainable” food has won some major victories in recent years. Probably the most significant is the adoption by cities like Seattle and Los Angeles of a $15 minimum wage, a goal championed by fast food workers as part of the “Fight for 15” campaign. 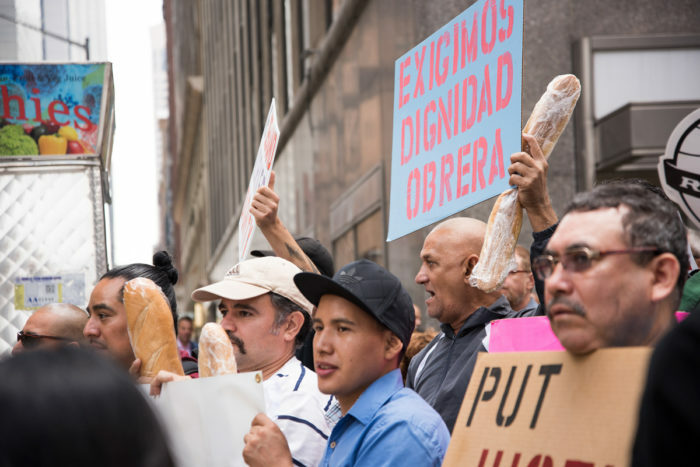 But as organizations like the Restaurant Opportunities Center (ROC United) and the Food Chain Workers Alliance have tried to educate consumers about the importance of sustainable labor, they’ve found that a gap remains between consumers’ expectations and the cost of providing workers with sustainable wages and conditions. Some restaurants are trying to bridge that gap. In 2014 Huckleberry and several other high-end L.A. restaurants decided together to add health care surcharges to their menus. According to these owners, the reason to add a surcharge, rather than raising prices, is that it allows them to pay for their employees’ healthcare without having to count the additional income as revenue for the purposes of determining certain revenue-based expenses, like rent. It might also represent a step toward closing that gap between what sustainable labor costs and what patrons expect to pay, according to ROC founder Saru Jayaraman. “If you really talk to employers who are really well-intentioned, the reason that they do these things is that we all feel that consumers need to be educated and engaged about the true cost of food in restaurants,” Jayaraman says. Even so, the response among customers has not always been positive. A more radical example of a policy meant to bring the full cost of restaurant labor into pricing is the tipless model, in which employees receive set salaries and prices are somewhat higher to offset the lack of tips. A number of L.A.-area restaurants have received attention in recent years for trying to eliminate tipping, like Barcito, in Downtown L.A. and Bar Nine, a coffee shop in Culver City. Nationally, Danny Meyer’s restaurant group in New York has been tip-free since 2015. There are certainly some good reasons to get rid of tips. 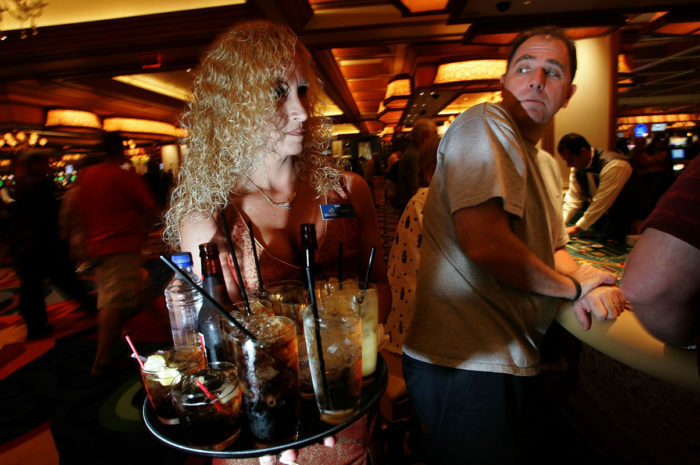 In many states, tipped workers are subject not to the standard federal minimum wage of $7.25 but instead to the federal “tipped minimum wage” of $2.13, meaning that servers’ total pay fluctuates daily. Nevertheless, in some restaurants, tipped, front-of-house workers end up making far more than the cooks, bussers, and dishwashers in the back. Cooks are more likely to be Black or Latino and servers more likely to be white: ROC has found, for example, that Latinos make up 25 percent of restaurant workers but 34 percent of back-of-house jobs. Tipping therefore contributes to disparities in pay between white and nonwhite workers; a problem exacerbated by the fact that patrons tend to tip white servers more than they do people of color. ROC’s research shows that in San Francisco, for example, where workers receive a $14 minimum wage, the restaurant industry has one of the starkest racial pay gaps in the country, with white workers earning $6.12 more per hour than workers of color. And tipping gives customers power over servers that can enable abusive behavior: In the small number of states that give tipped workers the standard minimum wage, the rate of sexual harassment in the restaurant industry is half as high as it is in states that offer them a lower wage. In other words, a world where workers did not depend on the often arbitrary, sometimes abusive and racist power of individual customers over their pay would very likely be a more equitable and more just one. The sticker shock and the loss of freedom can apparently be enough to drive some people away: a number of restaurants experienced drops in business after eliminating tips. Borgen says that most of her customers are almost always happy with the policy once they understand the reasoning behind it. “Once they’ve chosen to eat there, at the end, they’re pleasantly surprised.” But getting people in the door was another story. Susan Lord of the Bel-Air abandoned the no-tips model after a year. “Customers just hated it,” she says. These costs will put a strain on current labor practices. As Borgen put it, “Restaurants have been built on the backs of minimum-wage workers.” But that exploitative model cannot survive the rising costs of labor, she says. This may be one reason that some restaurants are looking for ways to shed service jobs entirely. At the same time, cultural expectations mean that people won’t always pay for cuisines they deem “ethnic.” “People are willing to pay $25 for a bowl of pasta, but not for a bowl of ramen—and it’s the same stuff,” says Landa. 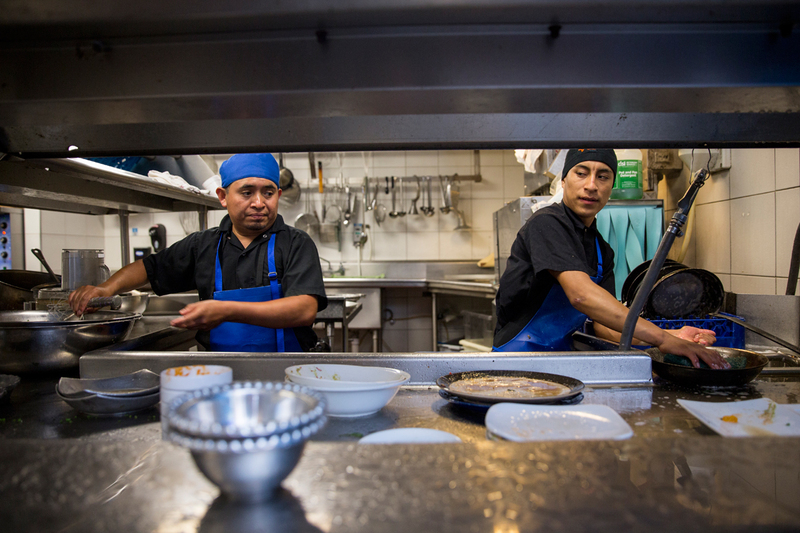 “These gaps in turn are unfairly absorbed by restaurants run by people of color and by immigrants.” If customers don’t change their expectations, it will be these restaurants that suffer most from California’s rising costs. So what about Huckleberry’s healthcare surcharge? Can restaurants help consumers understand labor costs by putting more of those costs on the menu? Jayaraman says that policies like the surcharge are at best a “half-step” on the road to sustainable conditions for workers. Such surcharges, it turns out, originated as a kind of protest against progressive pro-labor policies. When San Francisco passed a bill in 2008 requiring employers to provide healthcare to every worker in the city, restaurant owners coordinated to add surcharge-lines to their menus as a way to register their anger and pass the new cost on to their customers. But a civil grand jury found that not all owners spent the full amount they took in from the surcharges on employees’ healthcare, and thus that the policy could constitute fraud. Ultimately, San Francisco passed a law requiring money collected through surcharges to be spent on health care. 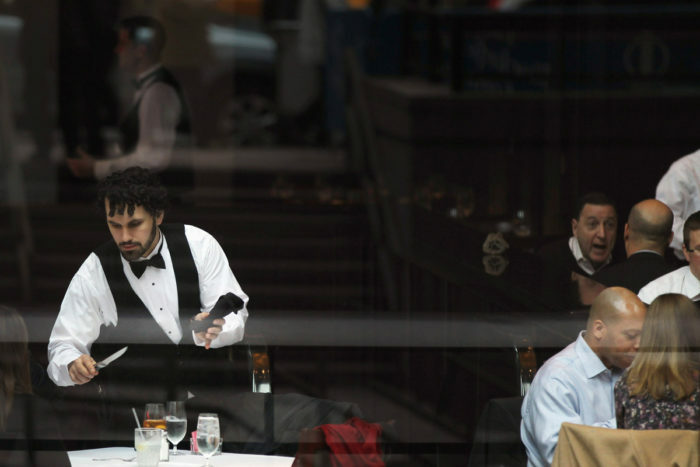 A waiter clears a table at a midtown restaurant popular for business lunches on November 22, 2011 in New York City. Jayaraman argues that many of the restaurants using surcharges today are well-intentioned, and that the charges can reflect common ground between these progressive owners and workers’ rights organizations like ROC. “We all feel that consumers need to be educated and engaged about the true cost of food in restaurants. That’s the bottom line here,” she says. 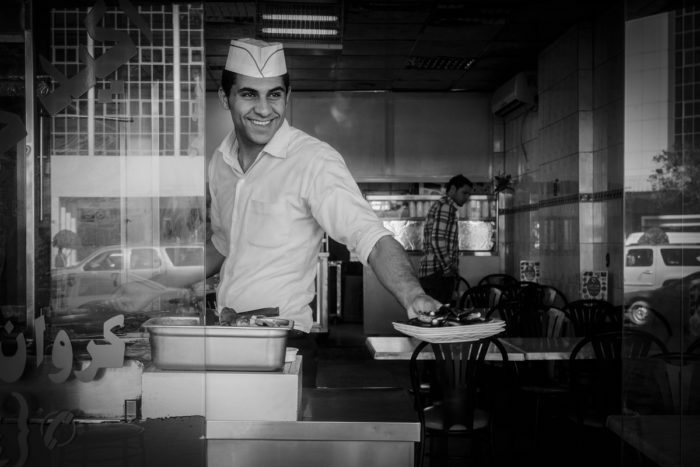 ROC publishes a Diner’s Guide that evaluates restaurants’ labor policies and identifies “High Road” restaurants that treat their workers well. More importantly, Jayaraman adds, the voluntary policies of individual, often high-end restaurants are simply not that impactful without political action. And she believes that only policy change can ensure that conditions for food workers are sustainable throughout the industry. In Santa Monica, for example, ROC’s advocacy led to the passage of a law requiring that service charges (another model some restaurants are using in place of tips) go to workers rather than owners. Josh Sbicca, a sociologist at Colorado State University who studies food labor, said that, while “it’s great if people know exactly where their food comes from,” food media’s focus on “the point of consumption,” and on the individual and personal politics of “voting with your fork,” is in some ways a distraction from the vital systemic change that labor movements like Fight for 15 and organizations like ROC fight for. Where we choose to eat—and how we pay for it—might not be significant by comparison. On the other hand, Jayaraman emphasized that concerted action by consumers can make a difference. ROC encourages diners to speak to restaurant managers about their labor policies (they’ve made videos suggesting how to do it). As a result, Jayaraman says, a number of Bay Area restaurants, including Blue Bottle Coffee and Alice Waters’ Chez Panisse, have joined RAISE (Restaurants Raising Industry Standards in Employment), an association of restaurants that embraces ROC’s “High Road” labor standards. After the 2016 presidential election, ROC and several High Road restaurants organized a program that helped 23,000 consumers push almost 800 restaurants to declare themselves “Sanctuary Restaurants.” Then, in 2017, when the Trump Administration tried to change regulations to allow restaurant owners rather than workers to pocket diners’ tips, ROC called on these restaurants and consumers to protest. Jayaraman credits that organized action with helping to defeat the change. For Jayaraman, these successes prove that “there are hundreds of thousands of people willing to think about politics when they eat out. We’re not asking them to think about it throughout their meal, but to take one small action.” For this reason, ROC is developing new models for consumer engagement. In the Bay Area, for example, the group is partnering with the research and activist organization Race Forward to work with consumers in pushing restaurants to desegregate their front and back of the house staffs. They’ve worked with Chef Daniel Patterson, for example, to help his Alta Group of restaurants go from hiring 11 percent people of color to 60 percent in 6 months. Now Patterson is encouraging more restaurants to adopt ROC’s Racial Equity Toolkit. Jayaraman says “the next step is mobilizing consumers to put pressure on more restaurants to do the same, so that more people of color can advance into livable-wage jobs in the industry.” She hopes that an organized and educated base of consumers could help push restaurants in other states toward emulating California’s approach to higher wages for tipped workers. Consumer pressure may also help move the conversation beyond the high-end restaurants that have adopted no-tips model so far. Ultimately, the most consequential change might occur if fast-food chains, rather than fine dining restaurants, were to adopt living wages and benefits for their employees. After all, when McDonald’s announced a switch to cage-free eggs, 200 other companies followed suit. This article is part of FOOD FUTURES, a new digital series created in partnership with UCLA’s Laboratory for Environmental Narrative Strategies (LENS) and KCETLink Media Group, which will explore current innovations and visions for ecological, equitable food systems. The series looks beyond both agribusiness and farm-to-table, and covers diverse possibilities for the future of sustainable food, drawing on long histories of cultivation and eating. More FOOD FUTURES stories can be viewed at kcet.org/foodfutures and linktv.org/foodfutures. i think this is a very important issue. you can't care about food without caring about all the people involved in getting your food to the table. I blogged about Saru's book on my site. check it out if you get a chance.